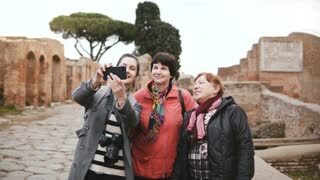 Young beautiful European girl taking a photo of two senior women near old historic ruins in Ostia, Italy on vacation. 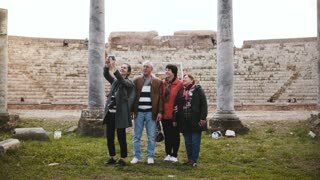 Excited happy senior Caucasian tourist woman taking selfie using smartphone at historic ancient ruins in Ostia, Italy. Excited happy senior smiling European woman taking phone photo of ancient pillar ruins in Ostia, Italy on vacation trip. Excited happy senior man and smiling European young woman taking selfie near old ruins in Ostia, Italy on vacation trip. 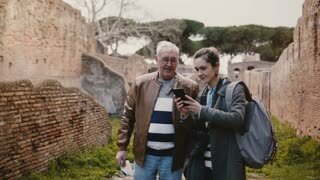 Young European woman and senior man enjoying walking tour around old ruins of Ostia, Italy during family vacation trip. 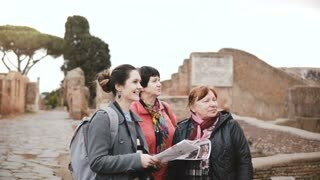 Excited happy mixed age European tourist women explore old historic ruins in Ostia, Italy, look at smartphone photos. 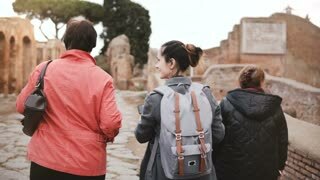 Two Caucasian senior female travelers and young woman guide enjoy exploring historic ruins of Ostia, Italy on vacation. Happy senior European man taking smartphone photo of two older women posing on Venice street in Italy during vacation.